With the possibility of a leftist anti-austerity party dominating Greek elections later this month, a high-ranking member of German Chancellor Angela Merkel’s party has said Greece could no longer “blackmail” the EU. Michael Fuchs, an MP for Merkel's Christian Democrats, issued a warning to Greek voters – increasingly attracted by the radical leftist party Syriza that has pledged to restructure economic reform and end austerity measures – when he said the “troika” [the International Monetary Fund, EU and European Central Bank] may be forced to forego future rescue loans. "If Alexis Tsipras of the Greek left party Syriza thinks he can cut back the reform efforts and austerity measures, then the troika will have to cut back the credits for Greece," Fuchs said in an interview with Rheinische Post newspaper published Wednesday. Fuchs said the 28-member EU and its core eurozone countries would no longer be pressured into saving the Greek economy from either collapse or exiting the EU altogether. "The times where we had to rescue Greece are over. There is no potential for political blackmail anymore. Greece is no longer of systemic importance for the euro." 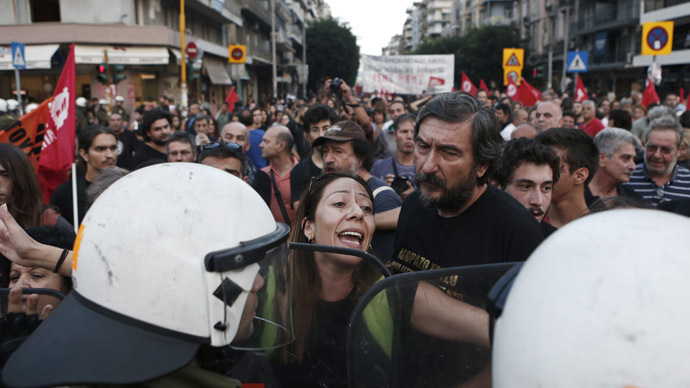 Syriza, capitalizing on a wave of public discontent with harsh austerity measures that Athens was forced to accept in return for a 240 billion euro bailout, has grabbed a 3 percent lead on Prime Minister Antonis Samaras’ right-wing New Democracy. Spending cuts in Greece are responsible for some 500 male suicides, according to an April study entitled “The Impact of Fiscal Austerity on Suicide: On the Empirics of a Modern Greek Tragedy,” which was published in the Social Science and Medicine journal. “Suicide rates in Greece (and other European countries) have been on a remarkable upward trend following the global recession of 2008 and the European sovereign debt crisis of 2009,” states the study’s abstract. Each percentage point decrease in government spending resulted in a 0.43 percent rise in suicides among men, it revealed. Between 2009 and 2010, there were 551 deaths that occurred “solely because of fiscal austerity,” the study found. 2010-2013: 7.500 more dead and 20.600 less births. Genocide in Greece thanks to troika. Berlin is proud of its Nazi methods against Greek. At the same time, employee salaries were slashed after February 2012 by 22 percent for workers over the age of 25, and a staggering 32 percent for those under 25, according to a separate report by the International Federation for Human Rights (FIDH). Meanwhile, doctors were forced to refuse to treat patients and delay operations due to cuts to the health service. Syriza, an EU-skeptic party, has witnessed a surge in popularity after pledging to cancel at least half of the bailout loan, which it says places Greece in a “debtors’ prison” to the EU and financial institutions. At the same time, however, the troika of lenders has demanded that Greece adhere to the agreed austerity program to qualify for any future bailouts – precisely what the party wants the country to avoid. PM Samaras rattled markets Tuesday when he warned that Greece may be forced to exit the eurozone if Syriza emerges victorious in the elections. Hans-Werner Sinn, head of Germany's Ifo economic research institute, said a Greek exit from the euro zone remained a possibility. "Further debt cuts will be needed again and again, unless the country is released from the euro zone and allowed to regain its competitiveness by devaluation," Sinn told the German daily Tagesspiegel. On Monday, German Finance Minister Wolfgang Schäuble put the issue more bluntly when he said the cash-strapped EU member has “no alternative" but to adhere to the reform measures it agreed to in return for the unpopular rescue package. Despite its tough warnings, the IMF admitted in its 2013 Ex Post Evaluation to mistakes in its handling of the Greek crisis, for example, acknowledging that “little progress was made in checking tax evasion by high income earners,” while average citizens were left holding the bill for the massive bailout.